A simple stretch for the hamstrings to loosen things out after a long ride can aid in cycling injury prevention. 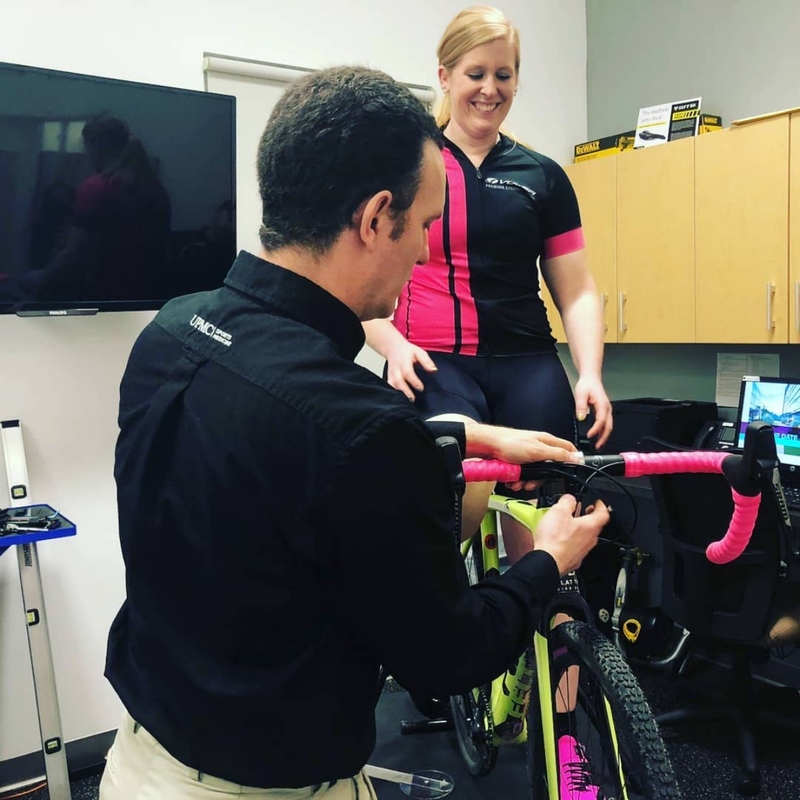 There are common injuries that nearly every cyclist faces, whether it’s knee pain, back pain, overuse, or pulled muscles. For most riders, cycling injury prevention can be aided with small maintenance and simple movements to keep the muscles supple and healthy. Mtbr sat down with Matthew Tinkey to hear what riders can do to prevent and heal from a variety of cycling injuries. Tinkey started his love of cycling on dirt at a young age, building jumps and rolling around his childhood neighborhood. In his teens, this fun turned into a full-on obsession with all things cycling and endurance. Matt Tinkey works with clients at the UPMC Lemieux Complex in Cranberry, Pennsylvania. Tinkey subsequently pursued a degree in sports medicine and exercise science. Noticing a void in the market, Tinkey also pursued certification from the National Academy of Sports Medicine. Now a certified bike fitter, he has worked with thousands cyclists in the past 12 years both for fitting and pain management. 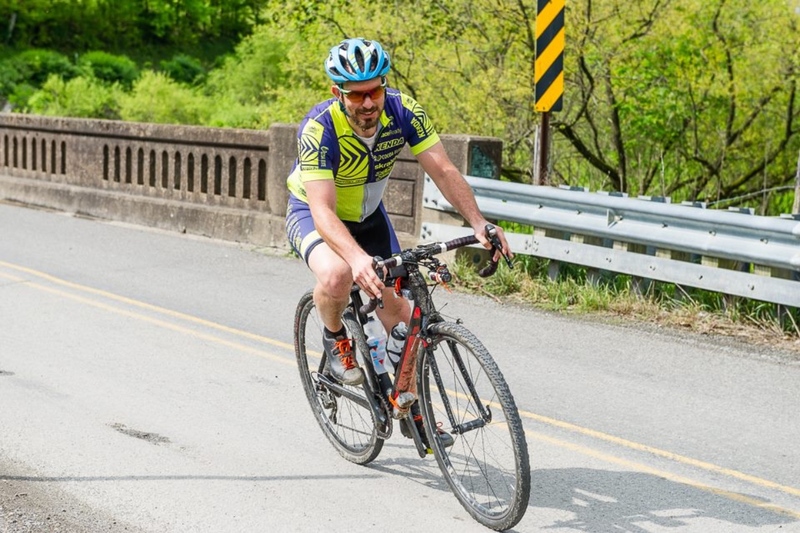 Currently, Tinkey works at UPMC Sports Medicine with both young and old athletes, with a focus on cycling injury prevention. Mtbr: What are the most common injuries you see with cyclists? Matt Tinkey: Common Injuries I typically see are overuse injuries. These originate from the rider being in a position that is not the best for their body type and riding style. However, the most common cause is weak and tight muscles in the hips and core. Almost all the pains I hear about both on the bike and after the ride is over could be solved with a stable stretching and strengthening plan. Some injuries are more serious than others but most can be prevented. In my opinion, gone are the days of ride your bike to get stronger and faster. I am a big fan of Pilates and yoga. Substituting just one-day a week will significantly reduce your risk of overuse, muscle, tendon, and ligament injuries. The other common injury I see and would like to see more coverage on in all disciplines and levels of our sport is concussions. There are many signs and symptoms of this complex injury. It is the severe injury. However, I see it ignored too many times, which often leads to longer recovery times and health issues that can linger for years. 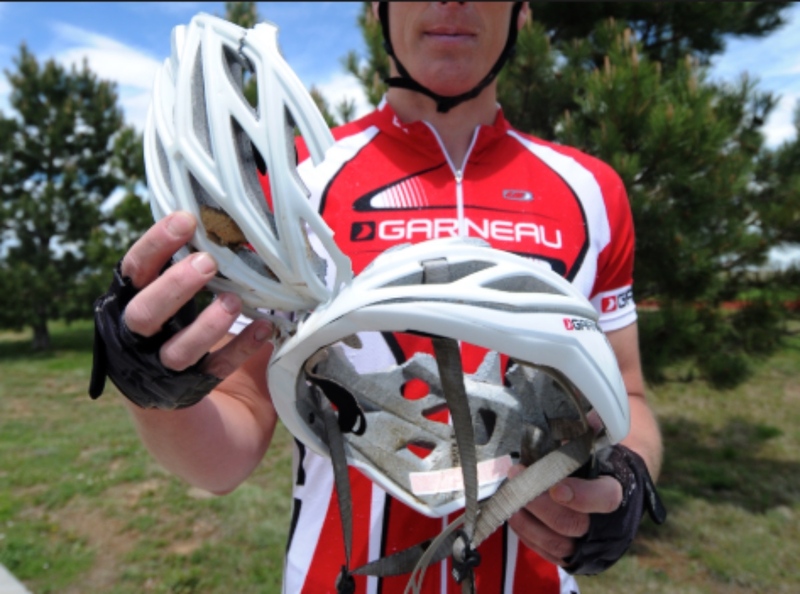 If you suspect a concussion in yourself or your riding partners be sure to consult with a concussion specialist. Mtbr: Are there common elements that lead to these injuries? MT: Yes, poor fitting bikes, going too hard to soon, and as mentioned above, weak and tight muscles in the hip and core. I consider core to be the mid-chest to below the hips. This is the powerhouse on the bike that both steers and propels you forward down the trail or road. The core must be both strong and flexible. The majority of us spend the day at a desk in a flexed position then we ride a bike in a similar position for a few hours. Add this up over weeks, months, years and it can lead to long-term issues in the Psoas and hip flexor complex. 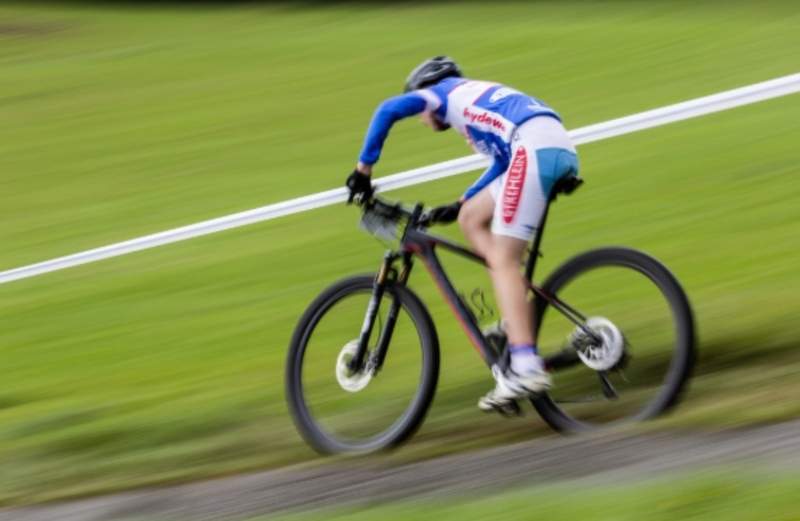 Bike racing puts huge demands on the body. If ignored small problems can become larger and even career ending. Mtbr: Talk more about fit related injuries? MT: When I started doing professional bike fittings in the early 2000’s the majority of clients I would work with had fit related injuries. Now, many clients I see are getting a fit before they have issues/injuries. I see this in two parts. One word is getting out and cyclists are aware of the options for a professional fitting. Two, because the word is getting out I am seeing many more clients. Saddles are also a huge and overlooked part of the process. I would like to see more fitters address this by allowing clients to demo saddles more. Too often the client says it’s okay. But as I have found out, this is because they have never tried anything else. I typically suggest experimenting, which opens up dialog. Often I hear of more issues and problems they failed to mention during the interview process. Tinkey enjoying some gravel road riding in the SweetWater Whiskey Rebellion gravel grinder. Mtbr: Once an issue is identified how do you start the healing process? MT: Going to a fitter that knows their limitations is vital. The best fitters have developed a vast network of experts in their chosen field, and if I cannot assist the client, I refer to orthopedics, osteopaths, chiropractors, physical therapists, yoga and Pilates instructors, and/or massage therapists. This team can help the client develop a plan of treatment to return the cyclist hopefully better, stronger, and more flexible than before. Mtbr: What are some movements riders can do to combat these issues? MT: I prescribe the following for my athletes that are suffering from tight muscles from training and overuse injuries. These movements are simple and very effective if done routinely and as part of your riding schedule. 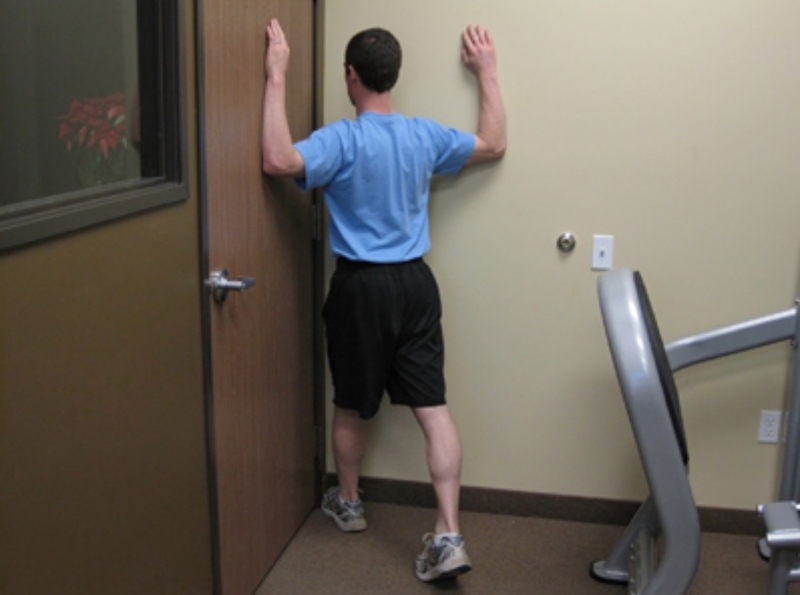 Demonstration of a kneeling hip flexor stretch a key in cycling injury prevention. Kneeling hip flexor stretch: Kneel on a mat with your right knee up and left knee on the mat. Shift your weight forward until you feel a stretch in your hip. Hold for 15 seconds, then repeat for your other side. The pigeon stretch is great for opening up the hips. Pigeon stretch: Come on to your back with your knees bent and your thighs parallel and hip-distance apart. Next, cross your left ankle over your right thigh, making sure that your ankle bone clears your thigh. Actively flex your front foot by pulling your toes back. When you do this, the center of your foot will line up with your kneecap rather than curving, which can stress the ligaments of the ankle and the knee. Maintaining this alignment, pull your right knee in toward your chest. Thread your left arm through the triangle between your legs and clasp your hands around the back of your right leg. 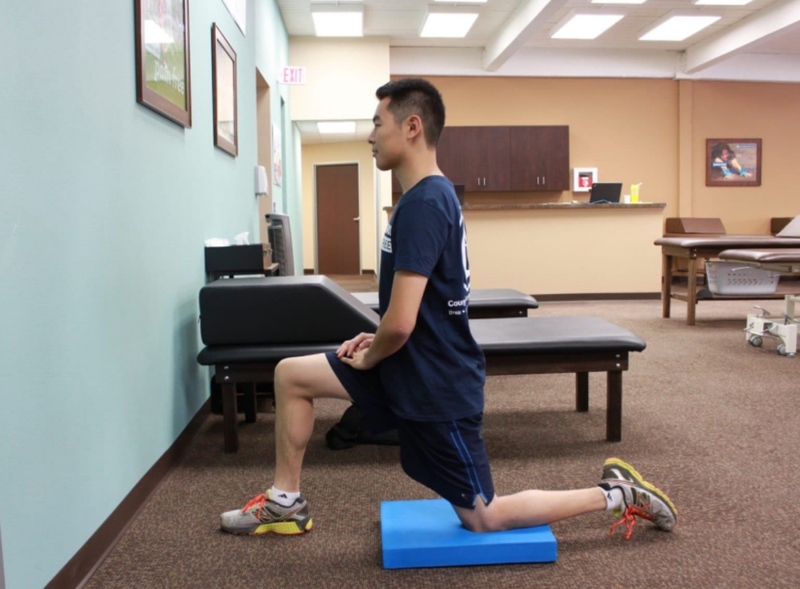 The corner stretch can be performed at home or in the office. Corner stretch: This is a fundamental exercise but can yield excellent results in stretching the chest and shoulder muscle, and all is needed is a corner of a room. Stand approximately two feet back, facing into the corner. Your feet should be together, forearms placed on each wall, and elbows are a little below shoulder height. Lean in as far as possible without pain. You will feel a stretch in the front of the shoulders and chest. Hold the stretch for 30-60 seconds. Many cyclists complain about tight hamstrings. Here’s a stretch that can help the issue and assist in Demonstration of a kneeling hip flexor stretch a key in cycling injury prevention. Hamstring stretch: Lay on your back. Keep one foot on the group with a slight bend in your knee. Raise the other leg straight up, steadying the thigh with a strap. Slowly straighten the knee until a stretch is felt in the back of the thigh, trying to get the bottom of the foot to face the ceiling, one leg at a time. Hold the position initially for 10 seconds, and gradually work up to 20 to 30 seconds. For more information about Matt Tinkey’s work and the UPMC Sports Medicine & UPMC Lemieux Complex check out www.upmc.com. The picture above for the Pigeon, doesn’t match the description. The description talks about lying on your back, and doing what is known as “eye of the needle” or “thread the needle” move.